Mrs Davies moved into the School House (Note 52) in April 1953. Her husband was a Civil Servant working in London and her only son, John, had just completed a University course. John worked locally as a farm manager to gain practical experience before joining the Ministry of Agriculture. 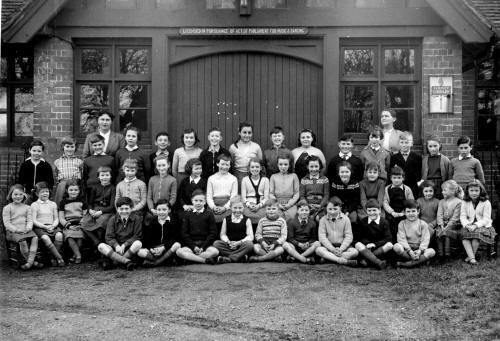 In 1953 there were 35 pupils on roll, but the school was growing due to the influx of families into the small Council Estate of twelve houses and bungalows being built in Ellery Rise. Mrs Davies was a very different person from Mrs Garrett, firstly she was Welsh and, although she had lived and taught in England for some years, English was her second language (Note 53). Teaching was much more formal than under the previous head, with a strong accent on the "three Rs", all written work had to be immaculate and every piece of work was marked carefully. Mrs Davies was a very hardworking teacher who expected the utmost from all her pupils; her long experience enabled her to sum up a child's capabilities swiftly and she was very competent at teaching the less able children and very patient with them. Although the children were less free to express themselves, this style of teaching suited the parents at that time. From 1953 to 1959 I was the only assistant teacher. With an increase in numbers came extra Capitation Allowance and I was able to start building up a stock of suitable apparatus for the younger children from the purpose built collection that was beginning to appear on the post-war market. On a personal level, Mrs Davies and I got on very well together; she had a ready wit and dry humour (Note 54), not apparent to her pupils! There is always an amusing side to school life if one chooses to find it. The only village activities during this period were to do with the Church, Mrs Davies joined in with these and particularly with the Village Fete held on August Bank Holiday Monday in aid of Church and School funds. Mrs Davies did the clerical work and I undertook the practical details. Each Christmas the school children gave an entertainment either in school or the Village hall. The infants usually performed a secular playlet followed by a Nativity Play given by the older children. This usually took the form of Tableaux to the accompaniment of carols. Mrs Davies was a good pianist and taught the children to sing well. One year the school performed a musical pantomime. Mrs Davies did not agree with the May Day festivities (Note 55) which she thought to be heathen, as did Father Atkinson. The Parsonage no longer housed the Curate and his family so the Rector, Rev W E Watts, took RI in school and school services in Church. Later he delegated these duties to Father Atkinson, a retired priest, who had come to live in the Village. Father Atkinson conducted Mass for the older pupils and took a short service of hymns prayers and a talk for the infants at the end of the afternoon on Saints' Days. Visits outside school and other interruptions to the school timetable were infrequent. Each year in July the school attended the Music Festival held for schools in the district. July 1953 : Attended Music Festival at Lane End Village Hall. Juniors sang "Over the Hills and Far Away" and "Where are you going to my Pretty Maid"
Every other year school photographs of each class were taken, also individual and family groups. The Diocesan Inspector still called annually. May 1960 : A talk given on the meaning of the word "Commonwealth"
Added to the lengthening list of regular visitors were the piano tuner and the County Audit staff to audit school dinner registers and needlework sales accounts. Mrs Davies frequently logged the %age attendance for the week and gave reasons for a low figure. Coughs and colds were the usual cause but a series of epidemics of childish complaints swept the school. Booster doses against diphtheria etc were given in school at the normal Medical Inspection, also protection against poliomyelitis during a countrywide outbreak of this disease. Between 1953 and 1960 there was only one major renovation to the school building. For years the school roof had caused trouble. Whenever there had been driven snow, followed by a quick thaw, melting snow in the roof space leaked through the high ceilings. Broken tiles were numerous and a heavy rain storm necessitated buckets placed to catch drips. In May 1956 the school was reroofed. At various time new furniture was delivered, desks, cupboards and later tables for use in the hall/dining room/classroom. Mrs Davies had no trouble keeping domestic staff. When Mrs Hill the school cleaner resigned, Mr Smith a pensioner took on the job. Mrs Dean, the cook, retired and was replaced my Mrs Dutton. In the 1950s there were no ancillary staff to mind the children during the dinner hour, but Mrs Dean assisted in this capacity, quite voluntarily, by keeping an eye on the younger children through the kitchen window. Two of the older girls were always on hand to call for help from the teachers if need arose. The older children played on the hard surface area of the Village Green, they did not stray from it, and were not allowed to play with balls. When there were over 50 children on roll we were allowed a part-time teacher to take the upper infants and lower juniors, as a group, during the mornings. Unfortunately Mr Davies, who never enjoyed the best of health, died shortly afterwards. Mrs Davies gave up teaching and returned to the Swansea Valley to keep house for her elderly bachelor brother. Click to go on to the next chapter " Mr D A E Cox 1961 - 1965"
(52) When the Parmoor Estate was sold in 1946, the School House was bought by Lord Hambleden, Lord of the Manor, and leased to the Parochial Church Council for the use of a Head Teacher. (53) Mr Thomas, the P.E. advisor, called regularly at Frieth School and conversed with Mrs Davies in beautiful lilting Welsh. (54) The hymn on the first day of term was always Fight the Good Fight, which had a double meaning for us! (55) The Maypole was stored at The Firm by kind permission of Mr & Mrs West. Mrs Davies taught country dancing as part of the P.E. lessons. (56) The children sang "All things bright and beautiful"
(57) This was organised by the Wycombe District and was a highly competitive meeting. (58) In November 1956 Wycombe High School moved to new premises and Lady Verney High School took over the old building. This provided about 150 more 11+ places for girls in the Wycombe area. (59) During these years first Mr Moss and then Mr Winter were Divisional Education Officers at High Wycombe, both visited each school in the Division at least once a year. However they were well aware of what was going on for the rest of the time - supplied with information via other school visitors! (60) Although this disease was not nearly so virulent as during the pre-war years, the 1955 outbreak was significant. This was the last epidemic of Scarlet Fever in this area.